World-leading Jenway®, Stuart® and Techne® products are now manufactured and distributed by Bibby Scientific Limited, following Nova Capital's earlier acquisition of Barloworld Scientific. As one of four new companies established by Nova from the former Barloworld business, Bibby Scientific focuses on the design, manufacture and distribution of three famous benchtop laboratory equipment brands. The highly successful Jenway range of analytical products has particular strengths in electrochemistry and spectrophotometers. Combining high specification with excellent value for money, Stuart sample-processing equipment includes hotplates, shakers, rotators and melting point apparatus, and is the only benchtop range offering BioCote® antimicrobial protection as standard. Techne is a world-leading temperature control brand, offering a wide portfolio of thermal cyclers, water baths and block heaters for life science, research and clinical labs. Stuart and Techne products are developed at Bibby Scientific's headquarters in Stone, Staffordshire, while the Jenway range is manufactured at the company's Felsted, Essex site. All Bibby Scientific products continue to be available through good laboratory distributors worldwide and the highly experienced UK support team provide expert advice for users regarding the best equipment for their particular applications. 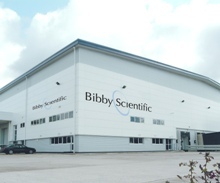 Bibby Scientific Limited has subsidiaries in France and Italy, as well as associated companies in Hong Kong and the USA, responsible for sales and distribution in these local markets.